Jo's method of working has been heavily influenced by the techniques of Monty Roberts and Kelly Marks. Monty Roberts’ Join-Up® technique creates a close bond between human and horse. Join-Up® uses this bond as a starting point to solving any behavioural problem a horse might have – from biting and shying to problems loading into trailers. After introducing the horse to the round pen, he is sent away – as a dominant mare would to a member of her herd to assert her authority. After changing directions a couple of times, the horse will show signs that he is ready to accept the person as the “chairman of the meeting” – his ear will be locked on, he will come off the sides to try to be nearer to the person in the centre, and he will lower his head and lick & chew (as if pretending to be grazing, i.e. passive and unthreatening). 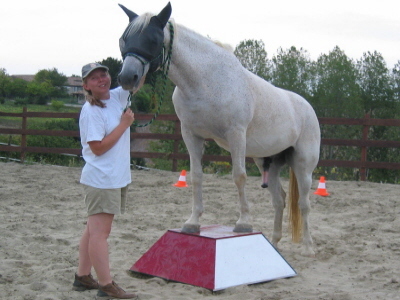 Seeing that the horse is ready to Join-Up, the person transitions to a passive, unthreatening stance and the horse will respond by coming to the centre of the round pen and gently touching them with his nose. That moment of Join-Up® is always an emotional one. 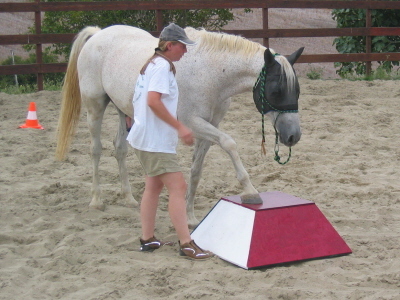 The person then proceeds to “Follow Up”, the next stage of the technique, which reinforces the connection by asking the horse to follow the leader around the pen in all directions. Once Jo has formed a bond of mutual trust and respect with the horse, a lot of ground work is then undertaken as a lot of problems start from the ground. This will include exercises to 'move the feet of the horse' to show the horse that you are a worthy leader, who deserves his respect. The nature of the training then is very much driven by the nature of the problem. If for example it is a horse that is very spooky it will include many de-spooking exercises to accustomise the horse to the many 'scary' situations he will meet in life, e.g. walking over new items, going into small spaces, being touched by strange items. Long lining is then used to increase the confidence of the horse (as it is the horse that passes the 'scary' item ahead of the handler) and to teach the initial aids to a young horse. We can then move on to riding the horse over/through the scary items. 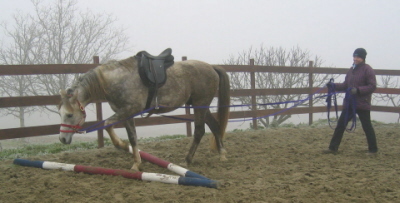 All horses are individuals and Jo's techniques are adapted to take into account the needs and character of the horse and to progress at the correct speed.